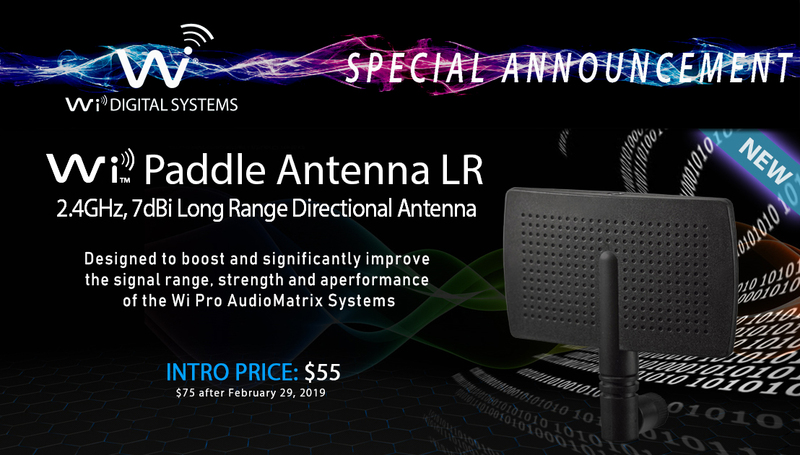 For a limited time, experience the NEW high power, ground breaking and highly sought-after Wi Pro AudioMatrix X8, 2.4GHz, 800mW Powered Antenna Stereo Digital Multicast Wireless System for DJ Gear & Active Loud Speakers for LESS! 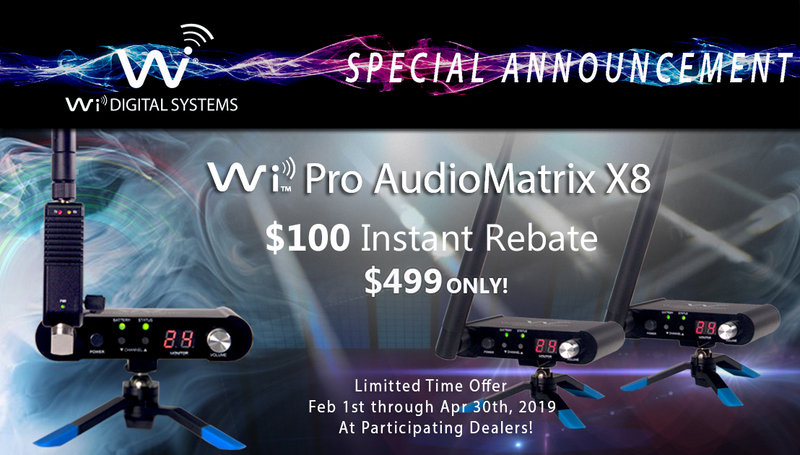 Starting from February 1st through April 30th, 2019, end users purchasing a qualifying Wi Digital Wi Pro AudioMatrix X8 Model WI-AMP50X8 will receive an introductory instant $100 rebate while supplies last. 7dBi long range directional antennas model WI-PA07LR bonus pack. 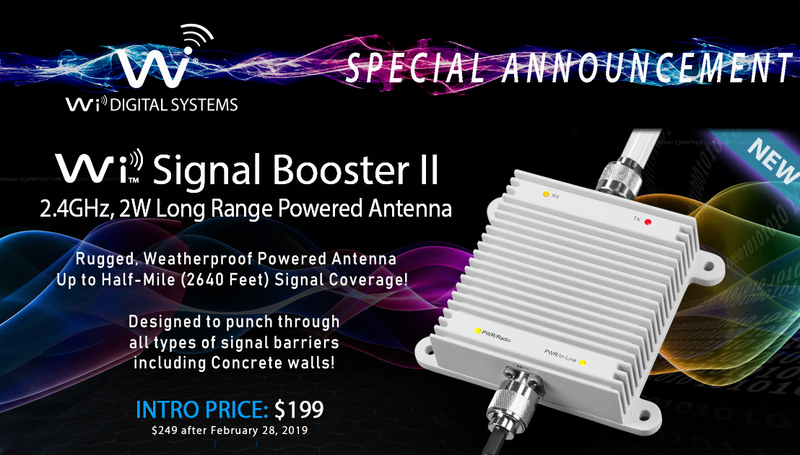 PLUS receive a free Wi Power Bank cable to power up the Wi Signal Booster powered antenna with optional external battery power pack. such as WiFi routers, lights, powered speakers, ballasts, transformers and more. 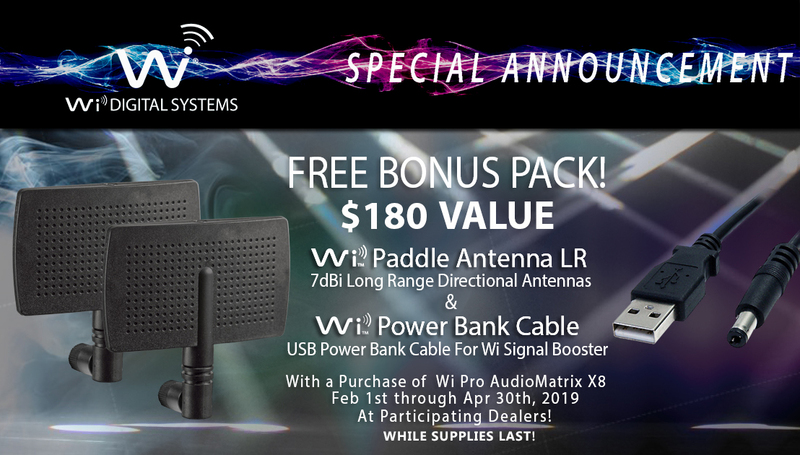 Starting from February 1st through April 30th, 2019, Wi Digital will be offering FREE two Wi Paddle 7dBi Directional Antennas Model WI-PA07LR and One Wi Power Bank Cable Model WI-PB800C for the Wi Signal Booster 800mW Powered Antenna valued at $180.00 with a purchase of Wi Pro AudioMatrix X8 Model WI-AMP50X8 at participating dealers while supplies last!